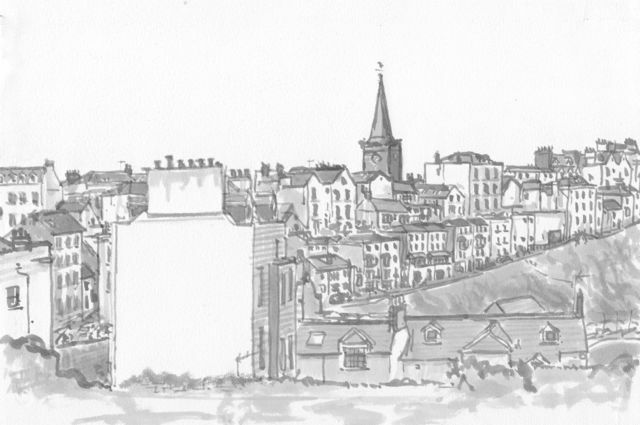 I’ve copied the two Tenby ink sketches (putting water-colour paper through our printer works!) and added some colour. The printer made the original ink sketch lighter and the overall effect is a bit washed out, but it’s interesting to compare with the monochrome originals; how the eye is drawn to other details and reads the scene differently… Preferences? 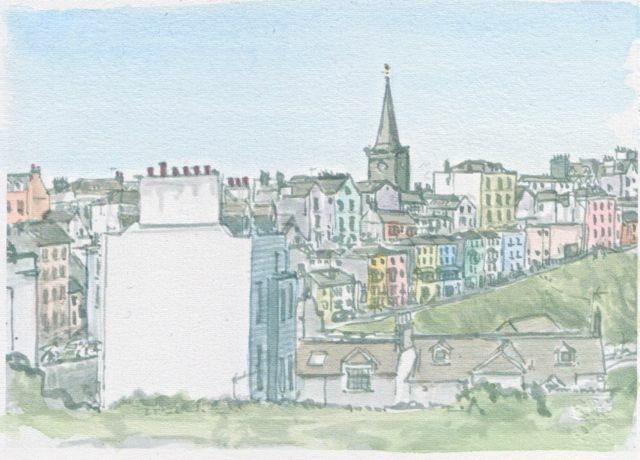 This entry was posted in drawing buildings, ink brush, street scene, Tenby, urban, urban sketching and tagged ink brush sketching, monochrome and colour sketches, Sidney Barnes, sketch of street scene, sketching technique, tenby sketches, urban sketching. Bookmark the permalink. This is such a great exercise, I must try putting watercolour paper through my printer and do the same! A great learning opportunity. I think the second sketch improved with colour – it really made each house stand out and gave the city some extra shape. I´m not sure about the first sketch, though. It´s like the green at the far end of the street mated with the green around the shop entrance and reduced the depth of the street. If the greens at the end of the street were bluer, they would probably look farther away. But I love the green store front and the red details, they give balance and life to it. These are some darn good drawings! I like your drawings very much, and your experiments with tone and colour, but I grinned my head off at the unexpected Northern Soul video. Thanks!